We've all seen videos of robots falling over, and yes, they're pretty hilarious. But people using powered prosthetic legs often suffer a similar problem - trips and stumbles often lead to a painful fall to the floor. Now, however, engineers at Carnegie Mellon University have come up with a potential solution. A team led by Hartmut Geyer has built a robotic leg that comes with a control system inspired by human reflexes. 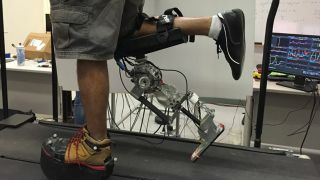 In both simulations and real-world testing, their leg proved significantly more stable walking gaits on rough terrain, as well as better recovery from trips and shoves. It's not perfect yet - it doesn't cope well with disturbances while the leg is swinging forward - but it's hoped that upcoming tests with amputees will solve that issue. "Powered prostheses can help compensate for missing leg muscles, but if amputees are afraid of falling down, they won't use them," said Geyer. "Today's prosthetics try to mimic natural leg motion, yet they can't respond like a healthy human leg would to trips, stumbles and pushes. "Our work is motivated by the idea that if we understand how humans control their limbs, we can use those principles to control robotic limbs."